these are quite small . 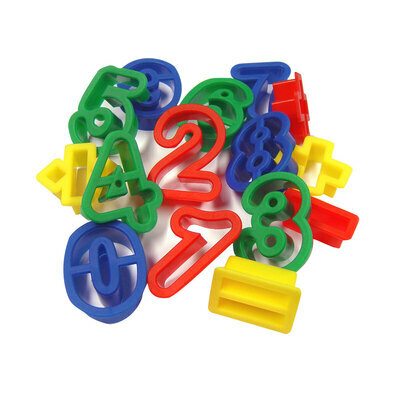 From playing with playdough to making masterpieces with clay, our Plastic Numbers and Symbols Cutters are sure to engage the youngest creator. Manufactured from a smooth and long-lasting plastic, they are each brightly coloured and easy to grip by smaller hand. Offering an engaging way to develop their numeracy skills through creative play, they have a blunt design that still passes through a wide range of clays and doughs easily. Use to reinforce letter recognition or start them on a journey to understanding simple mathematical skills including addition and subtraction. Alongside these cutters, we stock a wide range of engaging and handy craft resources for schools. From our 12 Block Watercolour Paint Set through to MDF Modelling Boards and Plastic Clay Modelling Tools, you'll find the right item you need here today at exceptional wholesale prices.